Geo-Solutions completed a leachate interceptor trench via the bio-polymer trenching method at the Kim-Stan Landfill in Selma, Virginia. The interceptor trenches were installed as part of the landfill closure, to intercept and collect and treat leachate generated from the landfill and channel it into a treatment system. 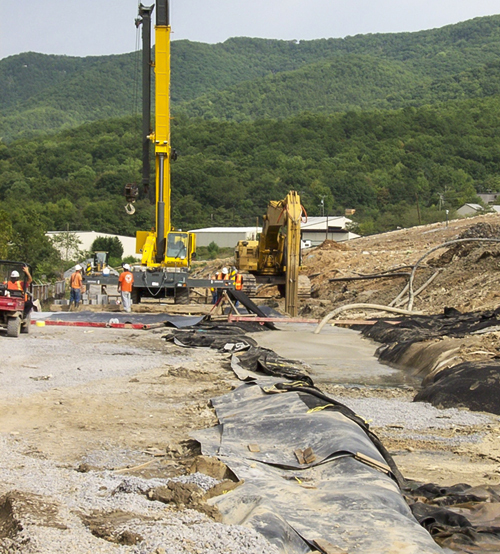 The 1,645 linear foot trench was installed to depths of up to thirty feet below ground surface (bgs). 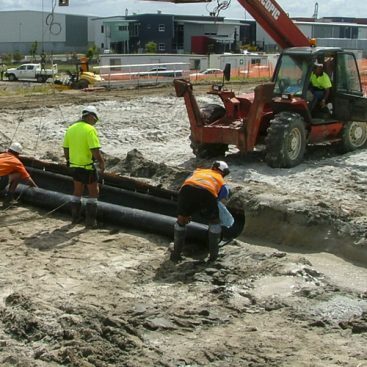 Bio-polymer slurry, was produced in Geo-Solutions’ high speed/high shear colloidal batch plant and piped to the trenches via high density polyethylene (HDPE) pipe. The three-foot wide trenches were excavated using a CAT 275 excavator. 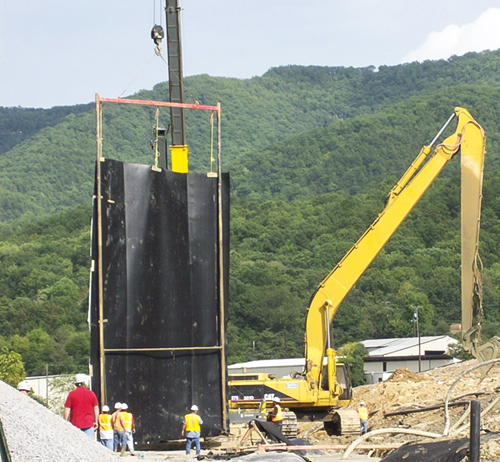 The interceptor trenches included the installation of twenty-two foot wide overlapping HDPE liner panels on the down-gradient wall of the trench to form a continuous HDPE vapor/groundwater barrier. A four foot wide strip of Bentomat was sewn to the overlaps in the HDPE panels to ensure a water-tight seal. Geotextile was placed in the trench to completely encapsulate the ¾” washed-gravel backfill and folded over the top of the backfill to allow capping material to be placed on top of the ¾” stone. Additionally, a 48 inch(diameter), 30 foot long manhole was installed in the trench containing two six-inch schedule 80 PVC pipes to accommodate the pumps that will be installed in the future. 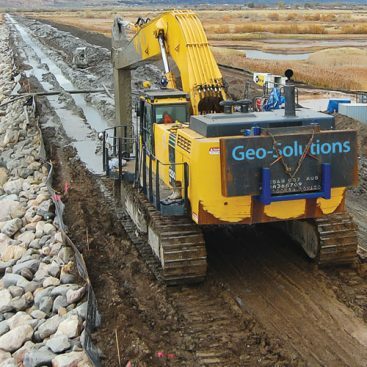 Geo-Solutions also installed a six inch perforated HDPE pipe one foot off the bottom of the trench to serve as a collection channel for groundwater/leachate to be sent to the pump station for treatment. 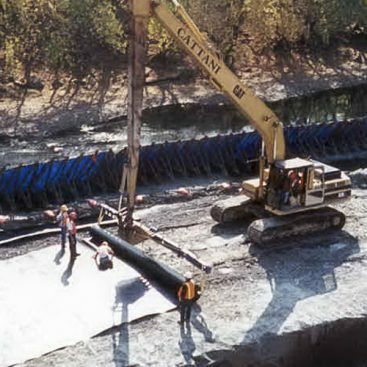 Nine four-inch HDPE pipes were installed at pre-determined intervals to serve as clean-out pipes for the collection pipe. Additionally, seven six-inch HDPE pipes were placed in the trench to serve as gas vents. Finally, two overflow pipe matrices were placed in the trench. Work pad instability due to unconsolidated soil and layers of trash, resulting in trench-wall instability. Extra care had to be taken to keep the trench completely full of fresh slurry at all times. 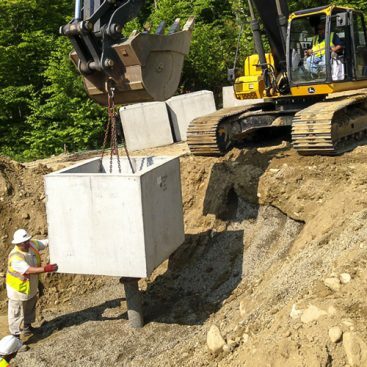 Diligent observation of the excavation and backfill process was necessary to recognize trench-wall sloughing and implement the necessary corrective measures to ensure a high-quality end product. Excessive groundwater, leachate and surface runoff. Recent weather conditions caused a surcharge of groundwater, surface runoff, and highly acidic leachate to migrate toward the trench during installation. To prevent premature slurry degradation and trench failure, slurry properties had to be constantly monitored to ensure biopolymer slurry remained viable. Geo-Solutions had to modify the standard chemistry of the fresh slurry to compensate for the constant influx of the acidic leachate. The project was completed ahead of schedule and with zero health and safety related incidents.